Last week I shared with you a recipe for Christmas Stollen. The recipe made 3 loaves of this wonderful bread. I made 2 loaves and put the dough for the 3rd loaf into the refrigerator and made it later in the week. 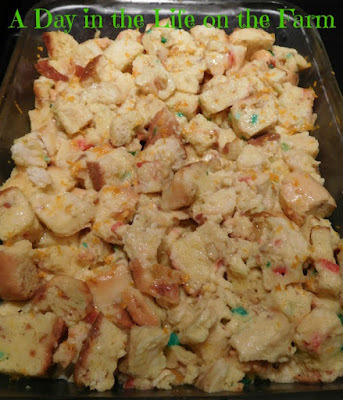 I still had about two thirds of a loaf left, along with tons of eggs since my ladies decided the strike was over and a half carton of light cream that needed to be used before the expiration date. 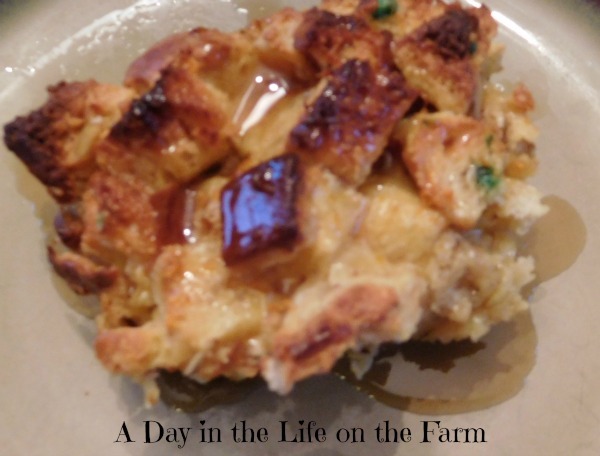 The perfect situation if you, like us, love a warm bread pudding for breakfast in the morning. 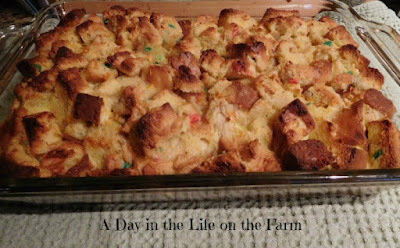 Bread Puddings or French Toast Casseroles are a wonderful way to feed a group of people. You prepare it the day before, put it into the refrigerator and when you wake up you put it into the oven while enjoying a cup of coffee and visiting with your guests. We have had a house full each and every day since Mom came home. I am not complaining, I appreciate so much everyone's concern and help. I also love having to worry about something other than "is Mom still breathing?" I can spend time in the kitchen doing what I love. The minute I start cooking I can feel the stress fall off my shoulders and onto the ground. A song hits my lips and with a tune in my heart I lose myself to mixing, stirring, seasoning, spicing and creating. When I pulled the casserole from the refrigerator to go into the oven, I spied an orange sitting on the counter and thought that some citrus would be beautiful in this dish. I grated the peel before juicing the orange and sprinkled it all on top of the casserole before baking. It was perfect! Served it up with some warm maple syrup. Poured another cup of coffee and prepared to face another day. 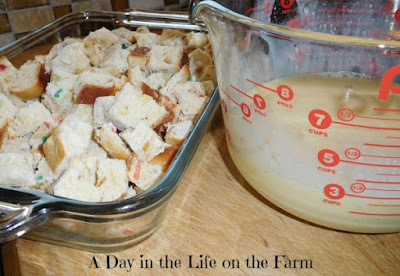 Cut bread into large dice and spread into a baking pan that has been coated with cooking spray. Whisk together eggs, cream and cardamom and pour over the bread. Cover tightly and refrigerate overnight.